This heartwarming little volume began as a stack of typewritten life stories that Michael Mazzarella had written over the years. His daughter hired us to create a book for him as a birthday surprise, and soon we received a box in the mail containing his stories and about a hundred original photographs. Although we never met Mike in person, we were charmed by his self-deprecating sense of humor and overall good-guy-ness. He is an expressive and entertaining writer and we thoroughly enjoyed this project. A placeholder ribbon comes in handy and looks classy. 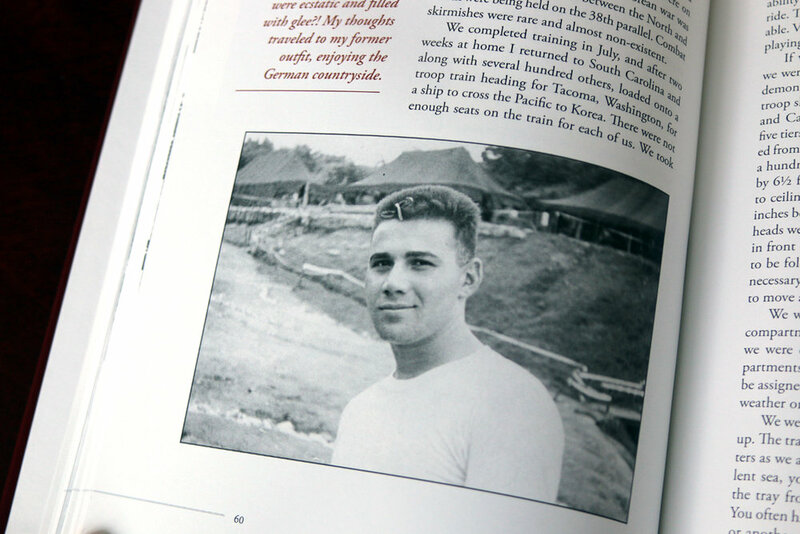 Young Mickey as a soldier in the Korean conflict. Is that a bow tied into his crew cut? Mickey's mother died when he was quite young, and he writes with great warmth about the woman his father married seven years later. He writes about his stepmother, "It was great to have an advocate, and a fashionable one at that." All grown up with a lovely wife of his own. A series of custom family trees concludes the book. A final tribute from Mike's children and grandchildren. A simple, elegant stamped leather cover in burgundy red.